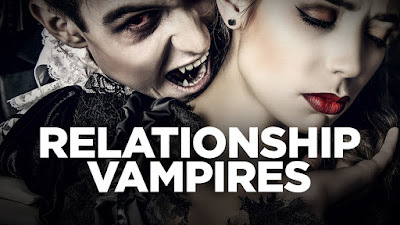 1) Do I feel better or worse when I'm around, talk to or think about this person? 2) Does this person usually have a positive or negative mindset and attitude? 3) Is this person taking responsibility for their life or always making excuses about being the victim of circumstance? 4) Do they support my efforts and excited about my success or do they complain about their own life when I achieve something or try to make me feel bad about myself or them? If a person is being a relationship Vampire (RV) than cut them loose and free yourself from their anchor of despair! Life is too short to keep spending time with people who are emotionally sucking you dry. I know how difficult this can be. Don't make it personal. It's not you, it's ME! Really, sometimes the chemistry just doesn't work. It could happen in your personal, professional or public life. Sometimes it's better just to cut ties and move on. 1) You will receive a body. You may love it or hate it, but it will be yours for the duration of your life on Earth. 2) You will be presented with lessons. You are enrolled in a full-time informal school called ‘life.’ Each day in this school you will have the opportunity to learn lessons. You may like the lessons or hate them, but you have designed them as part of your curriculum. 3) There are no mistakes, only lessons. Growth is a process of experimentation, a series of trials, errors, and occasional victories. The failed experiments are as much a part of the process as the experiments that work. 4) A lesson is repeated until learned. Lessons will be repeated to you in various forms until you have learned them. When you have learned them, you can then go on to the next lesson. 5) Learning does not end. There is no part of life that does not contain lessons. If you are alive, there are lessons to be learned. 6) ‘There’ is no better than ‘here’. When your ‘there’ has become a ‘here,’ you will simply obtain a ‘there’ that will look better to you than your present ‘here’. 7) Others are only mirrors of you. You cannot love or hate something about another person unless it reflects something you love or hate about yourself. 8) What you make of your life is up to you. You have all the tools and resources you need. What you do with them is up to you. 9) Your answers lie inside of you. All you need to do is look, listen, and trust. 10) You will forget all of this at birth. You can remember it if you want. This post about Col. John Boyd's OODA Loop, comes to you from the infamous Wikipedia. You can click the link if you want to read it from that source. The OODA Loop is yet another process that is simple and something we do all of the time, however understanding the recipe with greater clarity can help us to utilize these skills with greater success, especially during times of stress and conflict. 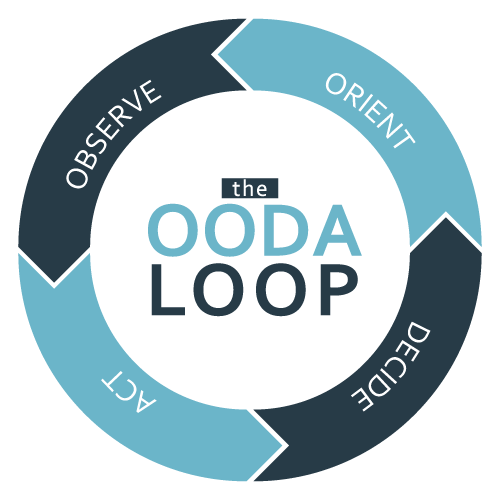 The phrase OODA loop refers to the decision cycle of observe, orient, decide, and act, developed by U.S. Air Force military strategist Colonel John Boyd. Boyd applied the concept to the combat operations process, often at the strategic level in military operations. It is now also often applied to understand commercial operations and learning processes. The approach favors agility over raw power in dealing with human opponents in any endeavor. The OODA loop has become an important concept in taking action in many area of life including: Litigation, business, law enforcement, military, personal defense and other decision based endeavors. According to Boyd, decision making occurs in a recurring cycle of observe-orient-decide-act. An entity (whether an individual or an organization) that can process this cycle quickly, observing and reacting to unfolding events more rapidly than an opponent can thereby "get inside" the opponent's decision cycle and gain the advantage. Frans Osinga argues that Boyd's own views on the OODA loop are much deeper, richer, and more comprehensive than the common interpretation of the "rapid OODA loop" idea. The second O, orientation—as the repository of our genetic heritage, cultural tradition, and previous experiences—is the most important part of the O-O-D-A loop since it shapes the way we observe, the way we decide, the way we act. In order to win, we should operate at a faster tempo or rhythm than our adversaries—or, better yet, get inside [the] adversary's Observation-Orientation-Decision-Action time cycle or loop ... Such activity will make us appear ambiguous (unpredictable) thereby generate confusion and disorder among our adversaries—since our adversaries will be unable to generate mental images or pictures that agree with the menacing, as well as faster transient rhythm or patterns, they are competing against. The OODA loop, which focuses on strategic military requirements, was adapted for business and public sector operational continuity planning. Compare it to the Plan Do Check Act (PDCA) cycle or Shewhart cycle. The key is to obscure your intentions and make them unpredictable to your opponent while you simultaneously clarify his intentions. That is, operate at a faster tempo to generate rapidly changing conditions that inhibit your opponent from adapting or reacting to those changes and that suppress or destroy his awareness. Thus, a hodgepodge of confusion and disorder occur to cause him to over- or under-react to conditions or activities that appear to be uncertain, ambiguous, or incomprehensible. The OODA Loop also serves to explain the nature of surprise and shaping operations in a way that unifies Gestalt psychology, cognitive science and game theory in a comprehensive theory of strategy. Utility theory (the basis of game theory) describes how decisions are made based on the perceived value of taking an action. The OODA Loop shows that prior to making a decision (the Decide phase), the person will first have to get information (Observe) and determine what it means to him and what he can do about it (Orient). In this way, the utility sought at the Decide phase can be altered by affecting the information the opponent receives and the cognitive model he applies when orienting upon it. ... the proper mindset is to let go a little, to allow some of the chaos to become part of his mental system, and to use it to his advantage by simply creating more chaos and confusion for the opponent. He funnels the inevitable chaos of the battlefield in the direction of the enemy. This simple yet powerful method can hopefully help you to be more effective at making and acting on decisions you make in many areas of your life. How many of us have said this to ourselves? If only (fill in the blank) then I will be happy, successful, fulfilled, etc? 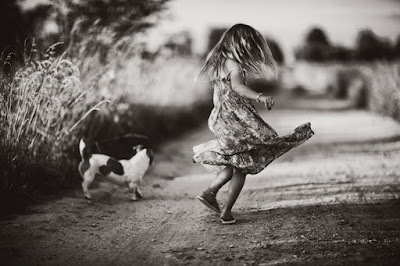 However, "if only..." is always just a step a way. No matter what condition is met there always seems to be one more "if only" preventing us from that elusive happiness, success and fulfillment. What if I told you that there is no "if only" outside of yourself, preventing you from being happy, successful and fulfilled? What then? Kind of scary isn't it? Once the water settles and there's nothing to hide behind, you have to deal with the fact that you have the ability to be happy and fulfilled right here, right now in this moment, not in some fanciful far off time or place or after some big accomplishment. What if I told you this IS it!? Right here, right NOW!? That's not to say accomplishing things in life is bad, wrong or doesn't bring with it a good feeling. But soon after the lights go down, everyone leaves, the award looses some of its shine, you are once again left alone with yourself. Alone to look into the mirror called your life. What do you see? Who stares back into your eyes? What do those eyes say to you? Do you continually find yourself starting your internal dialog by saying, "if only" followed by an idea that you are somehow lacking something inside of yourself or that you need something to complete you as a human being (sorry Jerry Maguire)? Well, that's your fears f#%king with you. That's your smallness lying to you, fooling you, trying to convince you that you weren't born with the seeds of greatness already inside of you! You don't need "if only" to complete you or make you happy or fulfill you. That bus will never come. “Our deepest fear is that we are powerful beyond measure. It is our light, not our darkness that most frightens us. Your playing small does not serve the world. There is nothing enlightened about shrinking so that other people won't feel insecure around you. We are all meant to shine..."
If only... you saw the truth, you are already there...You are your only "If Only..."